Who would have thought that ugly discharged Amish style wall quilt would end up looking like this! It was really one of those things that happens when art starts to morph into something it wants to be instead of what I want it to be. 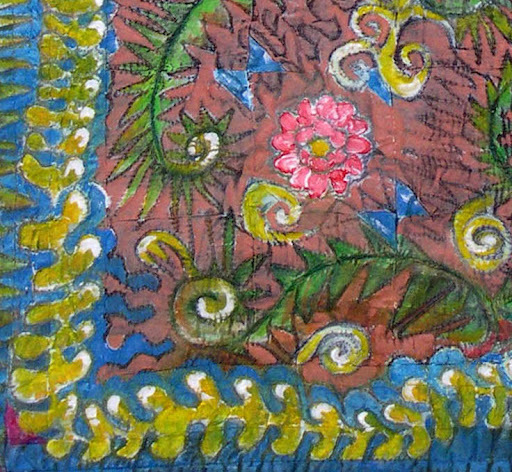 A little paint here, more paint there and soon a fiddlehead fern quilt looks like a piece of vintage Mexican pottery. Of course, now I have to give it a new name! We used to spend winters in the Rio Grande Valley. I had used broken pottery through out my Texas garden. I have often wished for some of it for my garden here. you're right — it does look exactly like Mexican pottery! wish you would show photos of its previous life, and the whole quilt. I think we should always love our own work. This project just shows that you should never give up on a project! Thanks for encouraging us to keep on embellishing and changing our art until it becomes what it wants to be (when we start to like it!) Love this! Great idea to paint and old quilt. Janice, this reminds me of Amate – bark painting! Cool piece! Thank you everyone! Robbie, I hadn't thought of Amate but you are right. I have always been drawn to primitive work of all kinds. It has such raw skill with little thought for perfection. It is art for the joy of making it.